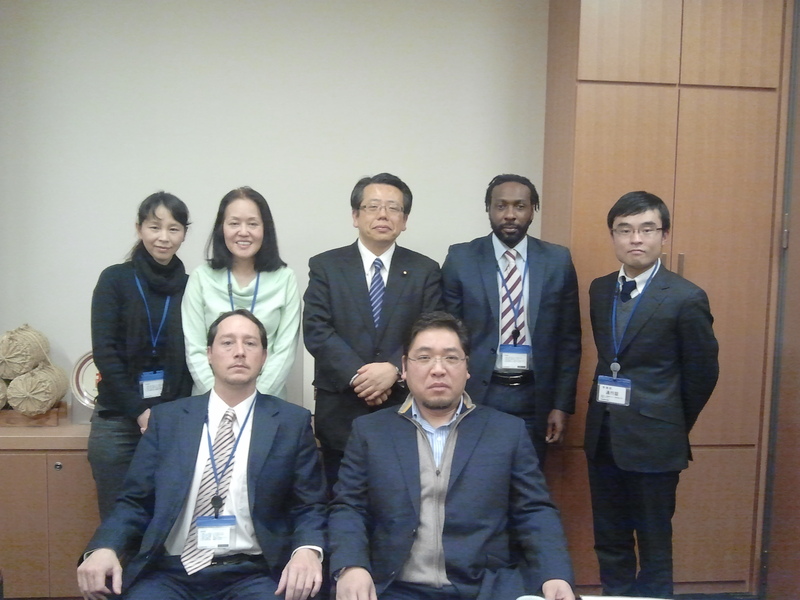 The leadership of Left Behind Parents Japan met with Yoshinori Oguchi on Monday, January 16th, 2012. 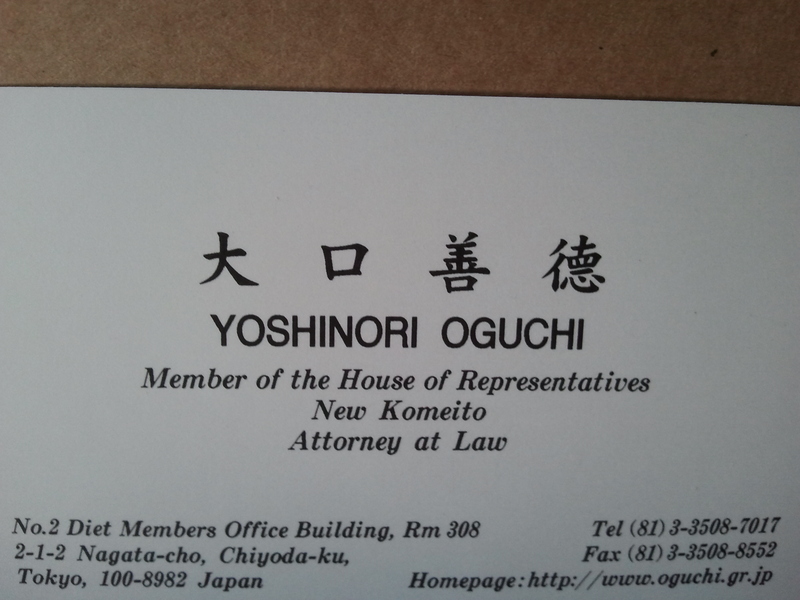 Mr. Oguchi is a member of the New Komeito party, the third largest political party represented in the Diet. He was a member of the MoFA committee who discussed modifying Japan’s civil code last fall, in order to sign The Hague Convention on the Civil Aspects of International Child Abduction. We presented our policy statement calling for joint custody, criminalization of parental child abduction, policy enforcement of family court orders, meaningful visitation for non-custodial parents, addition of a new visa category for parents of Japanese children to remain in Japan after losing spousal visa status and modification of domestic violence law in Japan to preclude false allegations with no empirical evidence. We asked if the committee had completed their recommendations to the Ministry of Justice at this time. Mr. Oguchi’s response was that joint custody and the Hague Convention were closely related. Regarding joint custody, it is a huge hurdle to overcome. Regarding the Hague Convention, we are now preparing to accede due to the foreign pressure to do so, especially from the USA. We asked if, in his opinion, joint custody was not going to move forward in this session of the Diet? His response was that there would be discussion of joint custody in the upcoming full Diet session. When asked about current cases of international child abduction his response was that resolving current cases was “quite impossible”. When asked (again) about resolving existing cases for foreign parents who have had their child abducted to Japan, Mr. Oguchi reiterated that existing cases of international abduction were not open for discussion and would not be considered. He said that MoFA and the MoJ had said it was “impossible”. Masako pointed out that Japan was continuing to press North Korea to resolve cases of abduction that occurred many years ago and that if Japan does not resolve existing cases of child abduction to Japan it will not reflect favorably upon Japan. She asserted that dealing with existing cases was very important. Carlos stated that the GoJ MUST create a way to reunite parents and their abducted children in the existing cases, both international and domestic, to not do so was unacceptable. Mr. Oguchi did not respond to this. Oguchi then said (in complete contrast to his previous answer) that he believed children had a right to see both of their parents. We asserted that only the installation of joint custody would protect those children’s human rights. Current laws are inadequate. We asked if Japan signs the Hague Convention, would Japan then use the police to find abducted children? 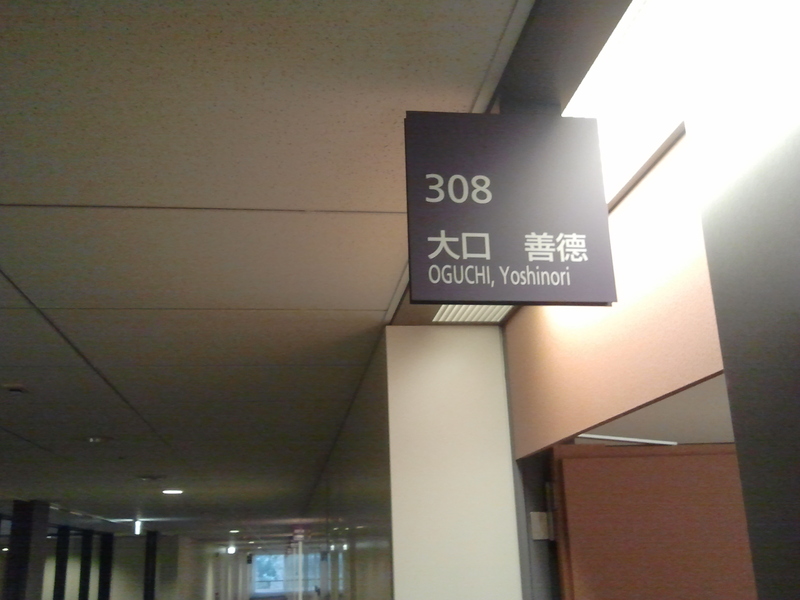 Mr. Oguchi said that police were used in cases of crime. If it is a crime then the police would be used. I asked if Japan has plans to criminalize parental child abduction? He continued that it is difficult to consider this a crime because it is the biological parent ( and custodial parent) who abducted the child. Japan does not consider this a crime. Carlos asked again if Japan needed to create a law which criminalizes parental abduction by either parent? We further discussed violations of agreed upon parenting plans…When visitation is modified, revoked or changed by the custodial parent currently there is no recourse for the non-custodial parent. Mr. Oguchi’s response to this was again that the Civil Execution Law currently in place for property transfers can be used for forced custody transfers. We asserted that this was only effective when the custodial parent voluntarily agrees to give over custody, it is not actually enforcement. Mr. Oguchi stated, regarding enforcement, “it looks difficult”. This Congressman was the most evasive to date. I left this meeting having discovered only one thing for sure. JAPAN IS NOT PLANNING TO ADDRESS OR RESOLVE EXISTING CASES OF ABDUCTION. This entry was posted in Uncategorized and tagged abduction to Japan, bruce gherbetti, bruce r. gherbetti, child abduction, child abduction to Japan, child abuse, children's human rights, children's rights, children's rights in Japan, Fukushima Children, Human Rights, international child abduction, international parental child abduction, IPCA, IPCA Japan, Japan Human Rights, julia gherbetti, julia suzuki, lauren gherbetti, lauren suzuki, LBPJ, Left Behind Parents Japan, parental abduction, parental alienation, parental alienation syndrome, rion gherbetti, rion suzuki, suzuki julia, suzuki lauren, suzuki rion. Bookmark the permalink. There are some really shocking things in here, not least “We have known this for six months. We know that Japan is trying to find loopholes to the Hague as it is currently written. Japan continues to portray foreign fathers as abusers”. Bruce, well done to you and the other parents on having this difficult meeting and wishing you all the best with your individual cases. Things must change. Read this Traditional Law and Cultural LAW that’s what it is the current system; And they are saying they are a democracy ? with a traditional law dating from the n1600 ? Keep your head up !! That guy sounds like the typical Japanese Politician. They evade the questions until you persist enough…..then they finally respond,only to further dodge the answer. Welcome to Japan! Don’t answer and save face. Things move slow. The only thing that changes fast is the Prime Minister and they can’ event remember what the last had started. SHAME ON THE JAPANESE POLITICANS.LAWYERS,The SYSTEM AND THE Endless B.S.